I don't really want to write a story about this because details ruin the initial shock, so I'll keep it short and sweet. 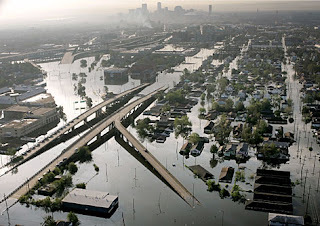 A Hurricane Katrina Victim is suing for 3 quadrillion dollars in damages. This hefty number, added to the sum of other claims filed by insurance comapanies, citizens and the city of New Orleans brings the total dollar amount of Katrina related suits to $3,014,170,389,176,410 (and counting). No country on this planet could survive losing 1 quadrillion dollars let alone 3, but I love the point thats being made. The damages are endless, the lives lost were priceless, and the U.S. can not even begin to compensate the people in Louisiana and Mississippi whose entire lives were gambled on account of an unstable levee.